There are times when the internet makes me furious, bewildered, and downright sad. So many trolls. So…many…trolls. But then there are times when the internet surprises me and restores my faith in humanity. I wanted to share one of those stories. It is a simple story, but its simplicity helps magnify the beauty of the story. It happened on Imgur (a site I frequent often). A user submitted a post, asking the imgur community to help him find a home for his two cats. This guy was very committed to finding these cats a home, offering $200 and food for life for the proper home. He even made a website just for this task. He honestly explained that he is not a cat person (a brave task to admit to imgurians, the primary home of cat lovers) and that he was stuck with these cats after his ex left him (the cats were his ex’s). It was a sad situation, but understandable. I was wondering what happened after the post, and luckily OP delivered (OP stands for ‘orginal poster’)! He just posted an update, and with a very happy ending- Vincent and Jules were adopted! OP went through hundreds of emails to find the right family, and luckily it worked out. He found a family that live near him (SoCal) with plenty of space for two cats. (They also own a food truck called Garlicscapes, so make sure you check them out if you’re down south!) 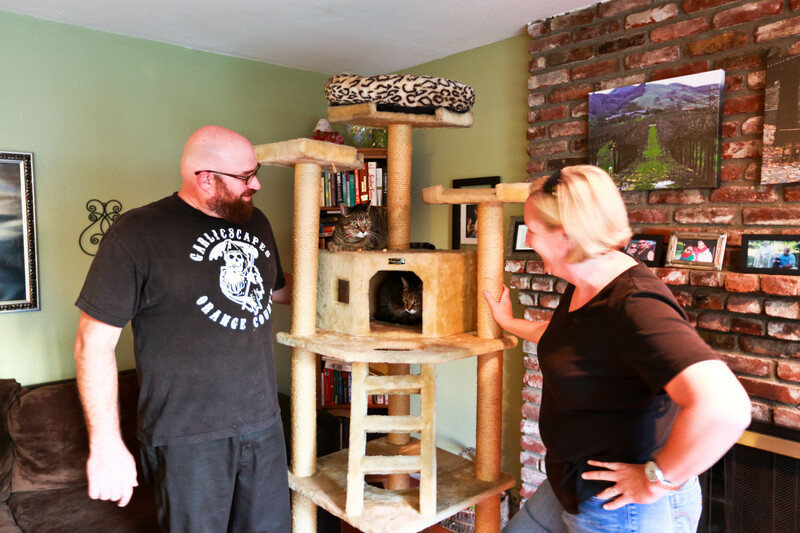 The family has seemed to latch on to the cats already and have already adorned their living room with a sweet cat tower. (Just look at that thing! It is glorious!) As a reader, you can’t help but get the feels knowing that Vincent and Jules will be living in kitty luxury, all because caring people connected on Imgur. So thank you, OP, for sharing your story! And a big thank you to the Dimmits for making room in their family for two furry friends! And of course, thank you, good guy imgur, for providing an avenue allowing people to connect and share their stories like never before. Do you have any favorite ::feels:: stories from imgur or reddit? Share below! It’s a bit outrageous though, I think I could pick up a garfield for a lot less at the shelter and get a snoopy too! BUt it is heartwarming to know so many people care about animals. Something to be thankful for this thanksgiving!